Interesting visit to the most representative archeological places that show the development of the Atacamenian culture. Discover the origin of this culture, visit the archeological monument called “Aldea de Tulor”, 2,800 years old. Relive, accompanied by native Atacamenian guides, the beginning of sedentary life of the first inhabitants of the Atacama Desert. 03 Nights in the hotel of your choice with breakfast. 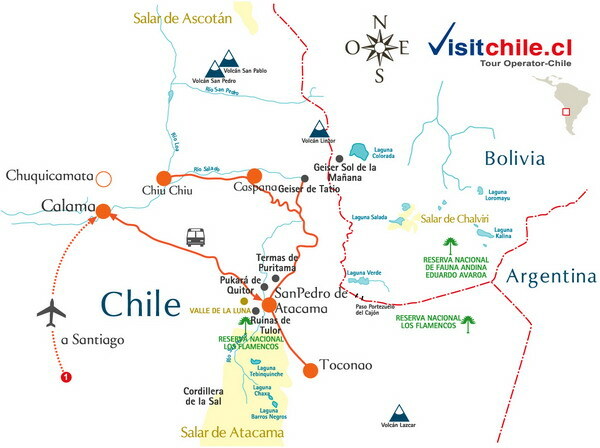 Reception and transfer to San Pedro de Atacama, from the airport to Calama. 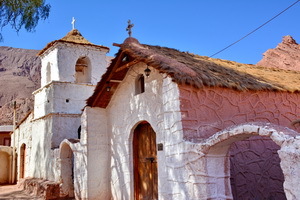 4:30pm Our trip will take us to see the capricious forms of salt and clay, as you will see in the “Three Marias” area.There you will be visiting the geological shapes located in one of the world's driest and most inhospitable zones, the Atacama Desert. You will appreciate the great molding power of the earth's natural forces, be amazed by nature's intricate work over thousands of years, contemplate and photograph incomparable sculptures. Enjoy an exciting experience in the salt caves, surprising shapes in the middle of the salt mountain range. The highlight of your desert adventure will be watching the Atacamenian sunset, opening you senses to the wonderful landscapes and colors of the Andes mountains, with the Licancabur Volcano as the millenary witness of another day ending in the desert. Breakfast. On this occasion, we’ll visit the great Salar de Atacama in Los Flamencos National Reserve where you can enjoy its immensity surrounded by fauna in the Chaxa lagoon and surroundings between the flamingos that prove to be the main attraction of the salt with their beauty. Then we will take the road to the Highlands to visit the lagoons Miscanti and Miñiques at 4,200 meters above the sea level at the base of the volcanoes of the cordillera of the Andes, through its paths we will delight us with the nature of a landscape of contrasts. We will then enjoy lunch in the town of Socaire village highlighted for its traditional cuisine. Finally, before returning, we will visit the town of Toconao, its bell tower and Church of San Lucas, both national monuments since 1951. Back to the Hotel. We go out to the Geysers of Tatio, leaving around 04:30AM, after breakfast, and the greatest activity takes place between 06:30 and 09:00 a.m., when atmospheric pressure generates huge steam columns that spring from the ground, producing a contrast between the mountains and the deep blue sky. On the way back we will pass along Machuca, an Atacama village which main activities are shepherding and will show its marsh, ducks and andean sea gulls. Are exempt from taxes for foreign travelers, non-residents of Chile. English guide in tourism van. Items of a personal nature such as drinks, phone calls, etc.